I love a burst of bold colour, and where better to wear it than at work?! Workwear can often be so dull and boring. Injecting some colour is fun and much easier during the warmer months. Colours seem much more acceptable in the sunshine. Also, there is something about a smart but colourful look that says "Confident and in Control"
I'm wearing a dress from probably my favourite 'dress' brand... Alie Street. If you've never tried any of their pieces, have a wee look at the way I've styled them HERE and check out their site HERE! The fit and quality are fab. And, before you ask, I'm not sponsored by them (I wish I was) I just love the dresses! A dress, smart bag and classic sandals. Are you adding MORE colour to your summer work wardrobe? What colours do you love to wear? Please share in the comments, or contact me HERE. NECKLACE & BAG: Charity shopped. Last week beautiful Amy caught my eye in her gorgeous outfit. I love that yellow dress, Samantha. Especially with your those sandals. Love that colour of leather. Tan is one of my favourites too Nancy. A little retro but classic and fun! Me too Laurie... and thank you so much! Love the addition of the brown accessories. I have a dress in a similar colour and was only musing today about what colour shoes and bag to use. I like the brown with mustard, but some might say it's a bit too warm and 1970's?! Such a chic look - the combination of brown leather bag and shoes and mustardy yellow dress - love! I see in the comment above you're wondering if it's too warm and 70s? I can see where the thought comes from with those colors, but each of the items is so modern in style that it doesn't speak as 70s to me at all. It's funny, I always think "1970's curtains" when I wear mustard... even though I love the colour! Hahahaha. Thank you for your thoughts on it, you are always so kind. 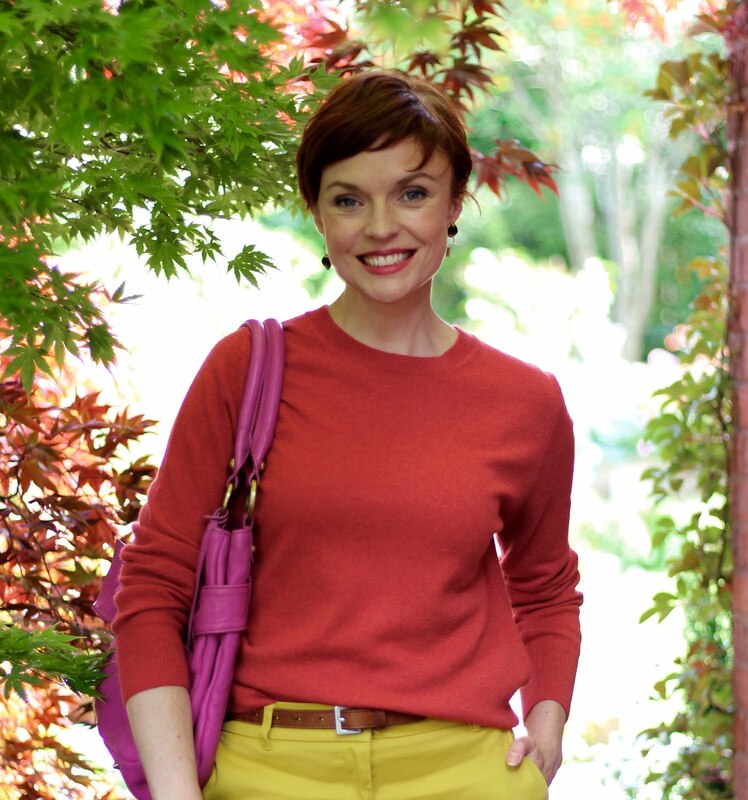 This is a lovely look - the bright mustard yellow is stunning on you, Samantha! The Clarks shoes are wonderful, and I like the unexpected colours in the necklace. Brava! lovely outfit and lovely color!, I think you look fabulous in it!. The dress fits you like a dream and looks really elegant and comfy!. And your accessorizing is so cool!. Samantha, what a lovely dress! And I agree with you that color should be injected into work wardrobes. This color is so beautiful on you...I wish I could wear more yellow, but it just doesn’t work on me. And how darling is your necklace! I am loving your sandals as well. Awww, you're so sweet to feature my look from last week! Thanks so much! I love your dress! The color and style is so pretty. Love that necklace too! Oh, this sheath dress is speaking to me! So cute with the heart necklace and sandals. I love this sheath style dress on you and your richly colored accessories! the mustard color is very pretty on you. Yellows are everywhere, aren't they? Mustard is a hard colour for sure. Yes I certainly add colour to summer work wear . Im seriously short of work yellow though and need to revisit that. It's such a cheerful shade Anna... I hope you find some! I love this colour on you Sam! The necklace is really pretty! This dress skims your figure SO beautifully and for that reason has a subtle sexiness but it's that pretty and fun multi-colored heart necklace that plays so beautifully with the dress that intrigues me. It's uncomplicated but makes a lovely statement anyway! You're just a genius with accessories Sam. You NEVER just throw on a necklace but rather seem to find jewelry that sets a mood. Those simple little pastel hearts add a sweet charm that REALLY WORKS!!! You're too kind Judy... but I'll take it (•blushes). This yellow dress is fabulous! I can't seem to get enough of yellow these days--even though it's really not my color. In fact I have two yellow posts lined up. One is with lots of blue--which I can wear. And the other is with more yellow on the bottom which takes the color away from my fact--because yellow can make me look, well, you know, sick! You look great in yellow?! Is it because of your hair color? I wouldn't have guessed with your coloring that it would look so awesome on you, but it does. And you and your figure! Stunning Sam. Awww Annie.... you're very kind and generous! This dress is a great fit but it does 'show the figure' if that makes sense? I used to worry about not being 'perfect' but now I kind of like it, probably because looking at perfect people doesn't interest me. I'm looking forward to seeing what yellow items you have and how you style them! !